Since Cuadrilla began building a fracking pad at Preston New Road near Blackpool in January 2017, people have been at the roadside every day, putting their bodies on the line to stop this toxic industry. The resistance is working – supply chain companies are pulling out and the building schedule has been delayed by months. Whether you’re part of an action group already, or you’re new to taking action and want to test things out, there’s roles for everyone, and support to take part. Whether you can come for 2 days or 2 weeks, whether you can chop veg, brew tea or take action – this resistance movement needs you, and we’ll be lending our support to local activity however we can. More details on the Rolling Resistance in July are here. In the meantime, if you can get to Preston New Road sooner, then there’s logistical details here of the daily protests happening already. We’ll update with a full schedule of events for July and secure sign up form shortly, for now, sign up to stay in the loop. Get ready. Get spreading the word. Get July in the diary. Check out the wrap-up of our Break the Chain fortnight of action in April. 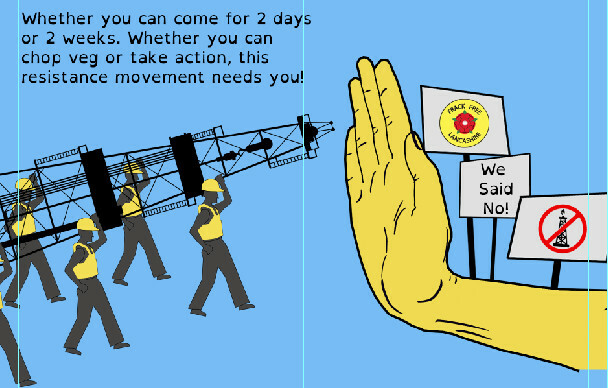 To get involved and trained up ready for July, join one of our upcoming Direct Action trainings. Reclaim the Power is a UK-based direct action network fighting for social, environmental and economic justice. We aim to build a broad based movement, working in solidarity with frontline communities to effectively confront environmentally-destructive industries and the social and economic forces driving climate change. We’ve been working to oppose fracking since 2013 when we organised mass action at Balcombe. Since then, we’ve hosted anti-fracking action camps in Blackpool and Didcot, and taken countless actions to expose and resist the industry. Previous post: #BlackBloc: And After We Have Burnt Everything?